The story takes place in Rabbit Back, an idyllic small town in Finland. But when you look closer, you’ll discover that there are unnerving things happening in Rabbit Back. The gardens are filled with statues of elves, gnomes and nymphs that are a little bit too realistic. The pet dogs run away to join the wild dog packs roaming the dark woods. People are having disturbing dreams and in the library the books mysteriously rearrange the words and change the stories inside their covers. Years ago, the town’s most prominent resident—the children’s author Laura White—formed The Rabbit Back Literature Society. She picked out nine gifted children who all became famous writers under her guidance. It has been three decades since she invited the last member to the Society, so it’s a pleasant surprise when she picks Ella Amanda Milana—substitute teacher with beautifully curved lips and a set of defective ovaries—to be the long awaited tenth member. There are many questions to be answered, and as the story develops and Ella tries to figure out what is going on, Jääskeläinen establishes the tension detail by detail, page by page. In the end, you’ll wonder what was real and what was imagined in Rabbit Back. Slowly Jääskeläinen feeds the readers with small pieces of information. Some are myths, like the Estonian legends about a wandering forest, or the myth about the water spirits being drowned ghosts who envy the living. It can be small observations about what Ella sees around her, letters she read, or newspaper articles. It can be small theories she develops and ponders, some quite philosophical. The main information source for Ella, however, is the members of the Society. She takes advantage of “The Game”, made for and developed by the society, and through it, she forces each member to reveal their true memories about the past. In my view, the psychological aspect is one of the strengths of this book. Jääskeläinen describes aspects of the human mind in a chillingly clear way. We have an old expression in Norwegian that translates directly to something like “silent water has the deepest bottom,” mostly used to state that shy and silent people can have deep wells on the inside filled up with feelings and passions. I thought of this expression several times when reading this book. Both because deep bottomless ponds actually exist in Rabbit Back, and because of Ella playing the Game to reveal the Society member’s deepest thoughts, fears and desires, many buried deep and unknown even to themselves. She’s even allowed to pinch them painfully if she senses that they don’t speak the truth. Also, I couldn’t help thinking about a stereotype foreigners often have about the Finnish people as shy, reserved and quiet. In my experience, The Finnish people are intelligent, warm people with a charming dry and sarcastic humour. Some of them just need space. If they don’t have anything to say, they won’t say anything. I think Jääskeläinen describes his characters beautifully. He also shows that authors are imperfect people too, when ribbed for prestigious awards and many book titles. And this is the second thing I loved about this book: Rabbit Back feels like a tribute to storytelling and literature. It explores the power of stories and those who write them. It can sometimes become a trap for authors to write about authors and writing, it’s too self-centered, but I think Jääskeläinen does it well. He writes a story about the authors in the Society and their writing processes, how they observe their surroundings and each other and use elements from their own lives in their writing. Rabbit Back tells about how a story can be read differently and that reading and writing can help you when you struggle with something in real life. At times it’s almost meta-fictional. The book moves between and beyond several genres and uses different elements from genres like fantasy, comedy, crime, horror, detective stories, and the realistic tradition. It’s refreshing. I think Jääskeläinen has created a wonderful magical world in his book with the Finnish winter, dark forests and bottomless ponds. All honour to the translator too. 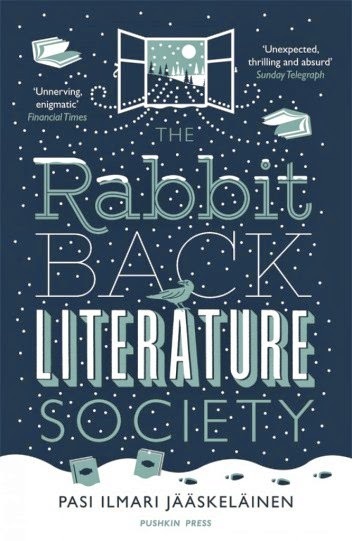 All in all, I feel that The Rabbit Back Literature Society is an entertaining and charming book, well worth reading.